•7,634 Elks adopted 38,342 veterans through this program. • Elks recruited 2,436 friends and family members to participate. • Altogether, these volunteers spent 45,473 hours serving and supporting these veterans. Many older veterans in hospitals, VA homes, nursing homes and care centers have limited or no family nearby. Without social engagement and positive interaction, veterans' health can suffer. 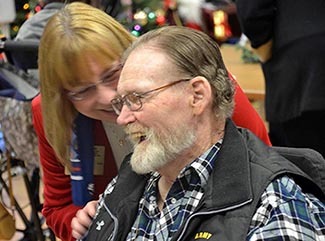 The Elks family is all over the nation, and Elks volunteers can support local veterans by participating in the Adopt-a-Veterans Program and providing friendship and assistance. Eligibility: This program is targeted toward any veterans that are lonely or isolated. Veterans in VA hospitals, assisted care homes, community living center, retirement homes, homeless and transitional shelters, and hospital domiciliary programs are all eligible. Individuals can adopt more than one veteran, and Lodges can adopt certain floors, units or even whole facilities. Getting Started: VA hospitals have strict privacy laws. You may have to physically visit the hospital and make up your own list. Or, try contacting the facility's Activities Director or Social Services representative for the names of veterans. Additionally, churches, veterans groups, American Legions, VFWs or similar organizations may know a veteran in need of support. Need help finding local veterans? Check out our community guide. Recruiting Volunteers: Ask members to adopt a veterans at Lodge meetings and events. Approach schools, churches, civic groups and other community organizations about adopting a veteran, or contributing supplies, letters or gifts. Don't forget about youth volunteers—ask scout troops, Antlers participants and student groups to get involved. Guide for Visits: Be a friend. Ask questions. Listen to their thoughts and concerns. Visit regularly. Send cards. Check in with phone calls. Invite veterans to be guests at Lodge meals and events. Remember birthdays, special events and especially holidays. Cost of Program: The cost of this program is very small, and is almost always covered by the volunteer. Cards, small gifts and donations of necessary supplies are common. If a veteran is in need of a larger gift, this can possibly be funded through raffles, 50/50s, donations by individuals or Lodge groups such as the PERs or Ladies. Please clear all gifts with the facility beforehand. Additionally, many stores may offer a discount for a charitable project if you ask. Ready to get started? Read this list of outreach ideas. Check out other Elks Veterans Programs! Learn about the Veterans Leather, Elks VA Voluntary Service and Welcome Home, and Freedom Grants. Questions? Contact the Veterans Service Commission at Vets@elks.org or 773/755-4736. Or, contact Adopt-a-Veterans Chairman Stewart Israel at stewizzy@yahoo.com.